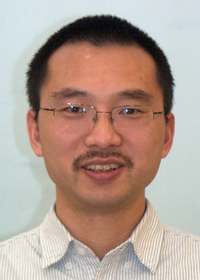 Nansen Center scientists, lead by scientist Dr. Jiping Xie, have published a comprehensive quality assessment of the TOPAZ4 ocean and sea ice model reanalysis for the North Atlantic and Arctic oceans in Ocean Sciences. The paper concludes that the 23-years (1991 to 2013) reanalysis show overall a good stability and good agreements with observations. In addition to the reanalysis the TOPAZ model and data assimilation system is currently also providing weekly forecast for the Arctic Oceans delivered as a part of the Arctic Marine Forecasting Centre (ARC MFC) under the European Copernicus Marine Environment Monitoring Service (CMEMS). The ARC MFC provides ten days forecast of ocean currents, water temperature, salinity, primary production, sea ice and waves with daily updates. Time series of averaged bias (blue line) and standard deviation (dashed red line) of sea level anomaly, sea surface temperature, sea ice concentration, temperature and salinity from in situ, respectively, in the Arctic region. They are filtered by a smoothing average within 28 days. 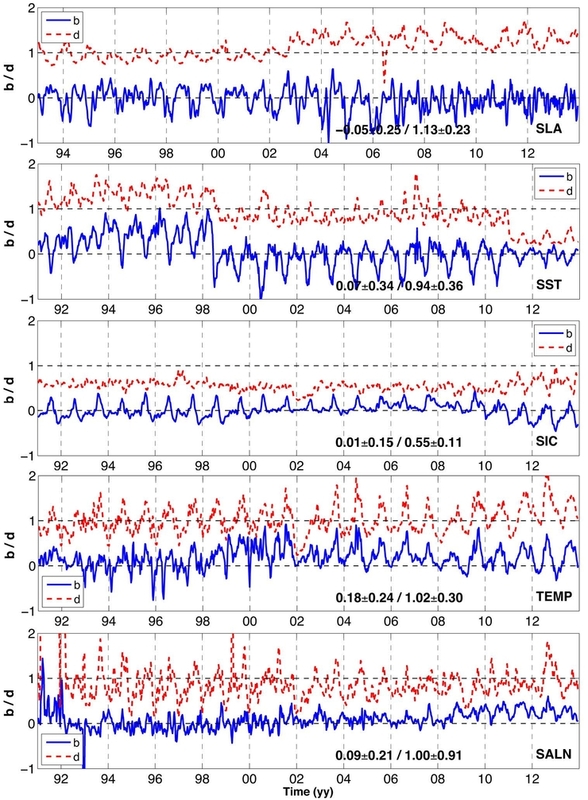 For details see paper Figure 3.The paper Quality assessment of the TOPAZ4 reanalysis in the Arctic over the period 1991–2013 published in Ocean Sciences by Dr. Xie et al. described a coupled ice-ocean reanalysis. 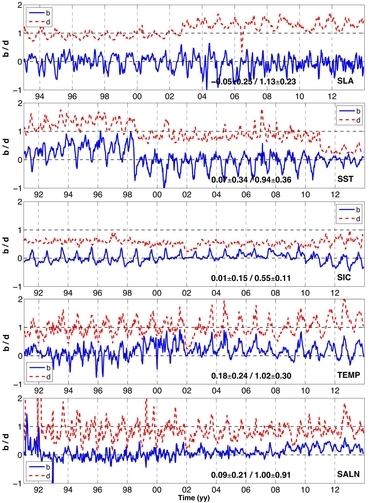 Long dynamical atmospheric reanalyses have been used for climate studies as well as including data assimilative reanalyses of ocean and sea ice in the Arctic, but the latter is less common. The TOPAZ4 is a coupled ocean and sea ice data assimilation model system for the North Atlantic and the Arctic. The model system is based on the HYCOM ocean model and the Ensemble Kalman Filter data assimilation method using 100 dynamical ensemble members. A 23-years period of reanalysis has been completed covering the years 1991 the 2013. The multi-year physical data products are a part of the reanalysis provided by CMEMS ARC MFC lead by the Nansen Center. This study presents the quantitative quality assessment, compared to both assimilated and unassimilated observations available in the whole Arctic region in order to document the strengths and weaknesses of the TOPAZ system for users operating or studying the Arctic Oceans. It is found that TOPAZ4 performs well with respect to near surface ocean variables, but some limitations appear in the interior of the ocean and for sea ice thickness, where observations are sparse. In the course of the reanalysis, the skills of the model system are improving as the observation network becomes denser, in particular during the International Polar Year (2007-2008). The online bias estimation successfully maintains a low bias in the model system. In addition, statistics of the Reduced Centered Random Variables (RCRV) confirm the reliability of the ensemble for most of the assimilated variables. Occasional discontinuities of these statistics are caused by the changes of the input datasets or the data assimilation settings, but the statistics remain otherwise stable throughout the reanalysis, regardless of the density of actual observations. Furthermore, no data type is severely less dispersed than the others, even though the lack of consistently reprocessed observation time series at the beginning of the reanalysis has proven challenging. All authors are or have been scientists at the Nansen Center and Dr. Pavel Sakov is now affiliated to the Bureau of Meteorology in Melbourne, Australia. Paper citation: Xie, J., Bertino, L., Counillon, F., Lisæter, K. A., and Sakov, P.: Quality assessment of the TOPAZ4 reanalysis in the Arctic over the period 1991–2013, Ocean Sci.., doi:10.5194/os-2016-38, 2016.